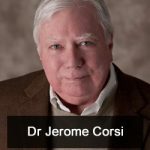 Jason Hartman talks to Jerome Corsi, author of Killing the Deep State: The Fight to Save President Trump, about what the deep state is doing to our society. The two tackle the issue of what the Trump administration can do to fight back, why we need an internet Bill of Rights, the power of large corporations and what we need to do about it, as well as the potential voter fraud in the 2016 election (and beyond). [1:47] Who makes up the Deep State? [5:15] What kind of recourse does the Trump administration have to protect themselves? [18:22] What kind of regulation do these big companies really need?